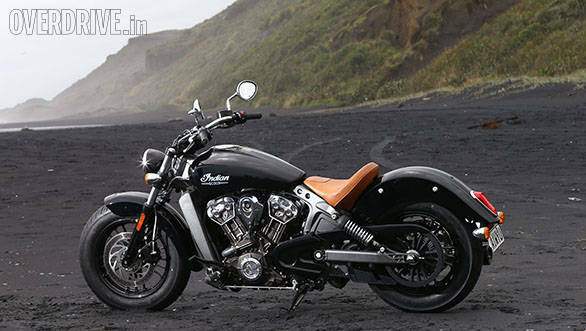 The Scout bookings have just opened in India and Rs 11.99 lakh ex-Delhi for a CBU import is a tremendous price. We're told there's no magic in the price. 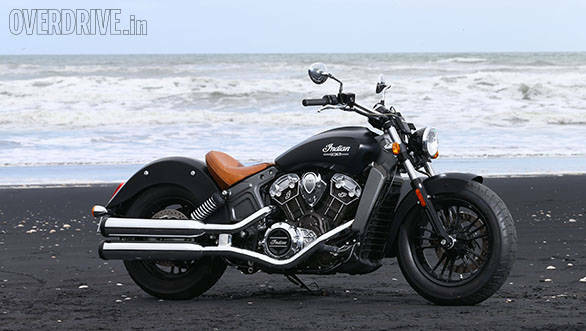 Indian Motorcycle consider India to be a very important market and low margins will have to do while the eventual, perhaps inevitable, assembly or manufacturing operation comes to life and breathes life back into the margins. Here's what you get for your money. What the Scout competes against? Indian Motorcycle likes to compare the spec against the Harley-Davidson Sportster 1200 Custom. Which is around the top of the Sportster line. And their presentation showed that by US prices, considering the optional and standard equipment needed to exactly equate the two motorcycles, the Scout is actually $4,000 cheaper overall. 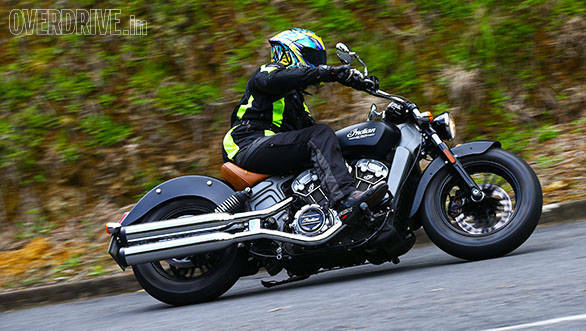 But while the Harleys are all about nostalgia, the Scout actually is in a playing field of its own because apart from the big wheelbase and the low-slung design, the Scout looks new rather than nostalgic or old. 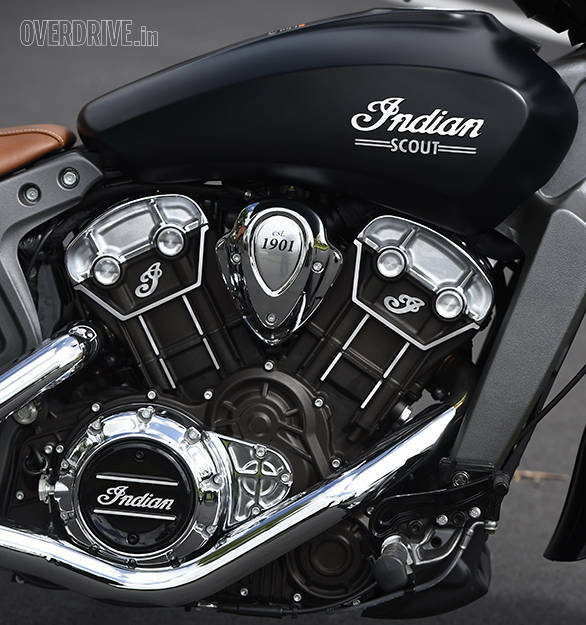 Indian like to say that all the detail on the engine cases harks back to the old Scout's cases - it's clear what's inside. 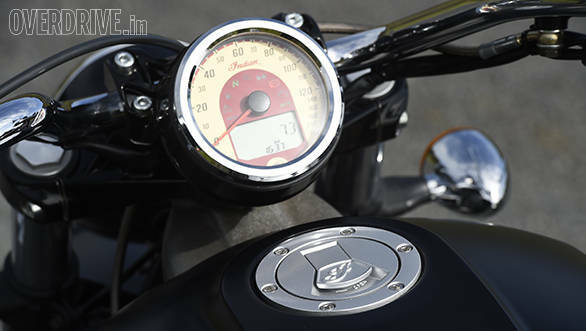 That, it's performance, both in a straight line and around corners clearly marks it out as a modern, fast motorcycle. And there're very few of those in the cruiser space. How's it to look at in the flesh? Terrific, actually. The flat lines and sharp-ish edges, that delightfully un-normal aluminium frame and the contrast of the tan leather seat actually work wonders for the Scout. Whether in the glossy colours or the matte ones, the Scout looks special and unique. When you ride one in India, you'll be the centre of attention without any shadow of a doubt. The Scout is fully modern. What that means is that the 1133cc V-twin is all new and up to date. It boasts liquid-cooling, fuel injection, a counterbalancer as well as an eight-valve DOHC valvetrain. Indian are using an oversquare configuration. And what they've achieved with this is an engine that feels unstressed throughout its rev range while managing to keep the torque curve high and flat between 2,000 and 8,000rpm. It's quite impressive, the motor. The frame is equally fresh. A small number of alumnium castings bolt to each other and to the engine to create the frame. Add fat tyres, thick forks and twin rear shocks and you have the bike. And how about on the road? 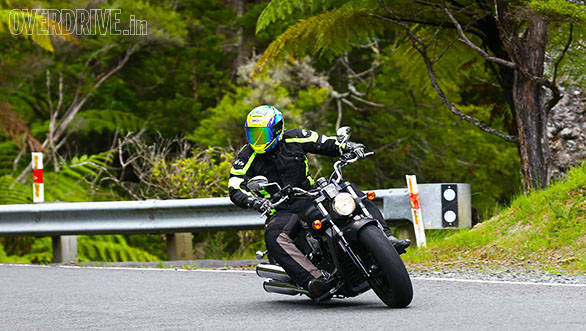 We rode the bike in New Zealand over mostly tight twisties with some highway and some sweepers thrown in. The first impression is that it's quite fast when you're in the mood. And then you note that it can be this kind of fast whether you're surfing the torque or actually revving the bike to the redline in a most uncruiser-like fashion. The Indian Scout's ability to rapidly move the speedo needle when you open the throttle seems to take no note of the gear you're in or the revs you're at. This makes the engine quite spectacular in use. The chassis similarly is great. With 31 degrees of lean angle available, the Scout overcomes its fat tyres to offer responsive handling and will confidently go all the way over the pegs when you ask. So good does it feel that I couldn't help but wonder how great the bike might feel if it had gotten either normal tyres or a more aggressively profiled fat tyre. Well, pre-bookings are now open and in theory you certainly can take the first steps towards that. But you should stop to consider a couple of things. First, Indian's dealership network is still really small. The Scout should be reliable overall but a small network is just that. It'll grow in time but until then getting things fixed and regular service will be more work. Second, the bikes we rode at the launch were inconsistent in feel and there were differences in power and smoothness across the bikes. We were told this was because the bikes we rode were pre-production. I'd suggest you wait till we can ride a full-on production model to ensure your money is buying you the incredible bike the Scout promises to be. Well in role, it isn't supposed to be. But the thing about the Scout that I was surprised by was that it didn't feel as effortlessly awesome as the Chief did. The Chief showed us that Indian Motorcycle, under Polaris, had the ability to create this dramatic sort of motorcycle that you instantly want - even if you're not actually a fan of that kind of motorcycle. I don't think the Scout - despite how good a middleweight cruiser it is - is that kind of special. It's a great bike, but unlike the Chief, it doesn't feel like magic. Maybe it is unfair to compare it to the ultra-luxurious Chief. Maybe it's an unrealistic expectation. But I guess all will become clear once we can sample a production Scout here in India.